On Saturday morning we slept in until 9:22! I can't tell you when I was last able to do that. It was amazing. We had breakfast in a diner and headed to Central Park. Ever wonder what 7 degrees in Central Park looks like? Here's a picture to help you get the idea. We saw the skating rink in Central Park owned by Donald Trump. Once again, it was way too cold to even think about putting on ice skates! Here's me with Hans Christian Anderson. See his little ugly duckling friend next to my leg? After Central Park (and a quick visit in the Metropolitan Museum of Art Gift Shop to warm up and a stop at Dean and DeLuca for a quick snack) we headed down town on the subway. We got off a Wall Street right by the New York Stock Exchange. The NYSE is right across the street from Federal Hall. This is where George Washington was inaugurated as our first president in 1789. Here's a shot of Duncan with him. After this we walked over to the World Trade Center site. I didn't take any pictures there for a number of reasons. From there we headed over to the World Financial Center which is right next to Battery Park. We knew the plane that had landed in the Hudson was docked there, so we thought we'd try to catch a glimpse of it. Because of the number of people that had the same idea as us, the myriad of emergency personnel, and all of the rescue equipment, it wasn't possible to see anything. We did, however, get this neat view of the three places we had visited on Friday all in one shot. After a subway ride back uptown and a rest at our hotel, we had some dinner at a yummy place in Times Square called Ruby Foo's. Then we headed back out into the cold. We walked around the M and M's store and a few other places. 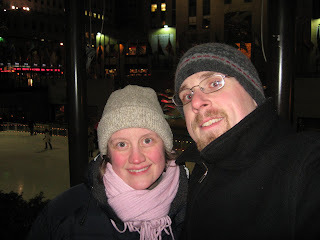 At that point, we headed back to Rockefeller Center and hit up the Magnolia Bakery once more. Oh yeah. Magnolia cupcakes two nights in a row! On Sunday, I didn't take any pictures. We woke up, grabbed a quick breakfast and then headed, on foot, to church. We decided to attend one of Redeemer Presbyterian Church's services that was held at Hunter College. It was close-ish...just 18 block up from our hotel. We got a pretty good workout to get there! 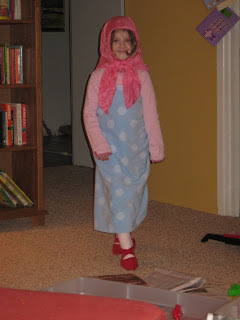 To top it off, it was a warm 34 degrees, so all of the layers we dressed ourselves in were making for some pretty warm walkers! We're glad we went. And the icing on the cake was to see one of my campus ministers from WVU and his wife sitting just four rows up from us! They live in Pittsburgh, were visiting family in New Jersey and had decided to drive in to Redeemer for worship. Pretty crazy to have seen them, especially since there were 2000 people in the worship service! 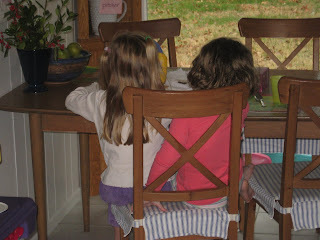 After church, we had lunch and headed home to our much-missed kiddos. They had a fabulous weekend with Bowie Grandma and Grandpa. We were thankful for the time away and even more thankful for the blessings that the Lord bestows on us each and every day. 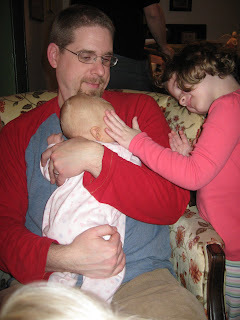 On Friday, January 16th, we dropped Amelie off at school, Violet and Linus off with my parents, and we were on our way to NYC by about 9:30am. 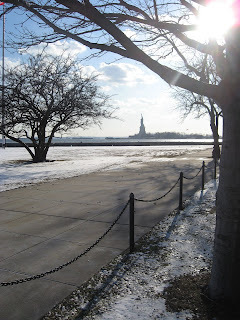 We made it to Liberty State Park(in NJ) just in time to watch the 1:00 ferry leave for Ellis Island. 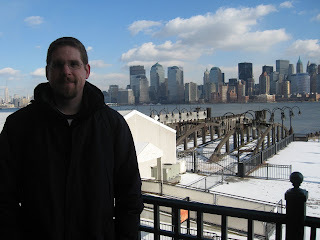 That meant we had an hour to look around the old train station and to check out the view of the Manhattan skyline, as shown behind Duncan. You can't see it, but just above Duncan's left shoulder is where the plane that landed in the Hudson the day before was docked. 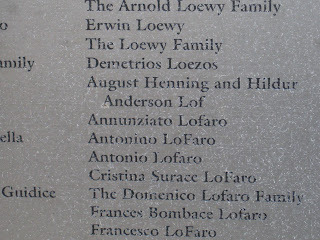 We took the Ferry to Ellis Island and looked up my relatives. Sten and Mathilda are my maternal grandmother's parents. Henning and Hildur are my maternal grandfather's parents. 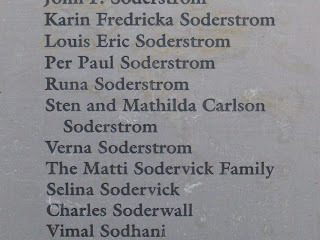 In other words, these are both of my mom's sets of grandparents that came through Ellis Island from Sweden. Pretty cool to see their names there. 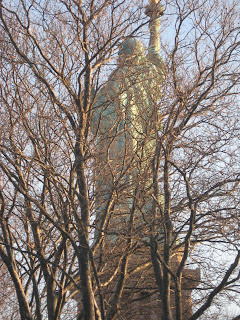 Here's a cool view of the Statue of Liberty from Ellis Island. 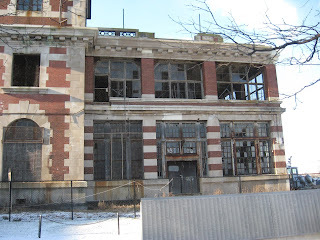 Much of Ellis Island remains unrestored. 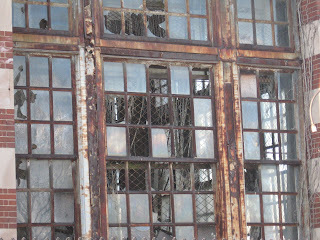 Here was a cool section of one of those buildings. 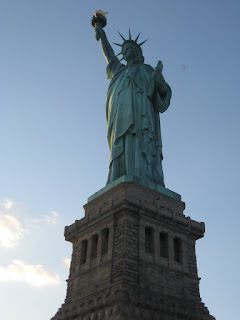 After we toured around a bit (we could have stayed for hours), we hopped back on the ferry to Liberty Island. 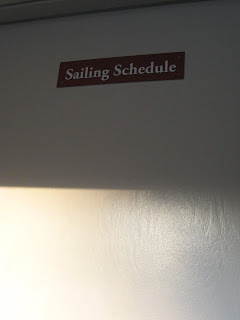 Fortunately, there was a very detailed sailing schedule on the boat, to avoid any confusion. 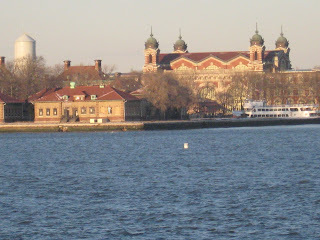 Here's a view of Ellis Island from Liberty Island. The building with the four domes on top is the one that is restored and contains the museum exhibits. At this point, you can't even get into the base of the statue without making reservations and getting tickets at least a week in advance. Therefore, we just got to walk around the island. 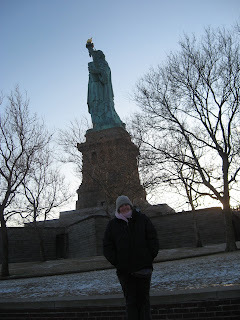 It was freezing, but we only had an hour before the last ferry left to take us back to Liberty State Park. 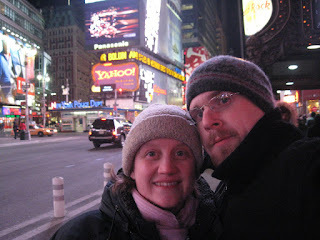 We arrived back at our car close to 6:00 and had to fight our way through the Holland Tunnel and into the city. It wasn't so bad and pretty soon we'd arrived at our hotel. 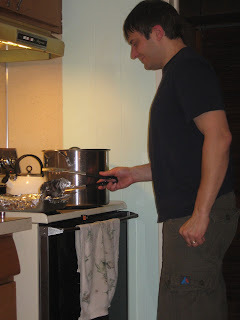 We got settled quickly and headed out to a nearby Italian restaurant for a yummy dinner. They we set off to find some of the close by landmarks! 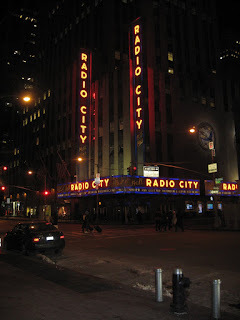 We found Rockefellar Center and Radio City Music Hall. 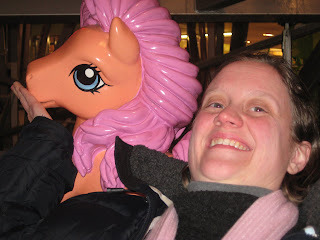 Then we walked to Times Square and hit the Toys R Us. We even took a ride on their indoor Ferris wheel! We got to choose between the Barbie car or the My Little Pony car. Duncan wasn't thrilled with either. But he made the best of the situation, making nice with his pony. Here's a self portrait in Times Square. We sent this picture to the kids as an e-mail postcard. 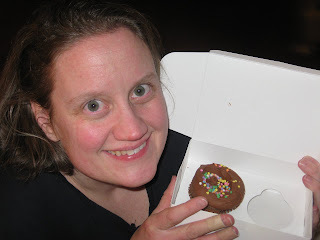 When at Rockefeller Center, we hit up the Magnolia Bakery for some of their yummy cupcakes. Here I am, hat hair and all, getting ready to enjoy some yummy goodness. Please excuse all of the nitty gritty details. I'm recording this as much for me as for anyone else. Next up will be the adventures of Saturday. 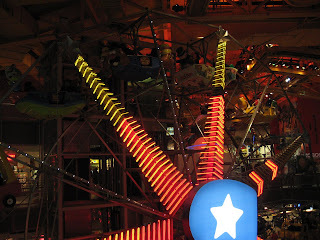 Toys R Us Ferris wheel? breakfast at the Cosmic Diner? lunch and coffee at World Financial Center? Battery Park and plane in the water? relaxing and readying for a night on the town? quality time with my husband on our first trip sans kids since kids? Today is my 33rd birthday. As I considered how to "celebrate" on this blog, I thought about birthdays past here at Tulipa Murillo. Two years ago, right before we found out we were expecting Linus and our whole world was thrown for a loop, I shared some resolutions. I know better that to try and do THAT again. 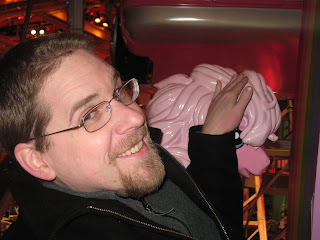 Last year, I did the usual "32 things about me" post. Quite frankly, I don't have time for such things. 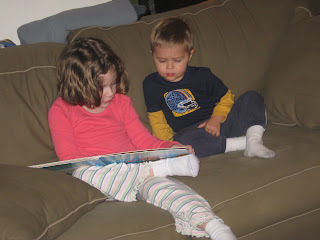 I shared thankful things as post 100. I REALLY don't have time for another one of those! And at post 200? Well...let's just say that three of you are still waiting for your 50 cookies. So much for the best of intentions. That, my friends, is what I am all about. 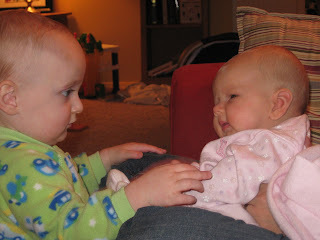 I pray that as you read this blog, these truths ring through. 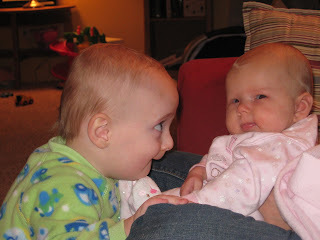 Thanks to sitemeter, I can tell I've picked up some new readers. If you feel like leaving me a comment, just to tell me you're checking in, I'd be tickled pink. Still the Bride. ALWAYS the bride. And yes, those are my prom shoes, for anyone who may remember (or care). Remember Precis? Glad they have some purpose after keeping them all these years. 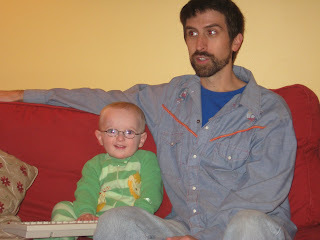 Duncan and I tried our hand at home day care a few weeks ago. The Skellys (the family of Baby Jillian of the previous posts) were to stay with us the Sunday of the WTP and head down to their family in Virginia on Monday morning. Duncan took a half of a day off to be able to spend time with them before they left. (This turned into a full day. You'll see why as you keep reading.) We hadn't seen them in four years, after all! Andrew and Duncan were friends in high school, roommates during their freshman year at Penn State and again in State College while Duncan worked for the CCO. The nice thing about the Skellys is that no matter how long between visits, it feels like no time at all. 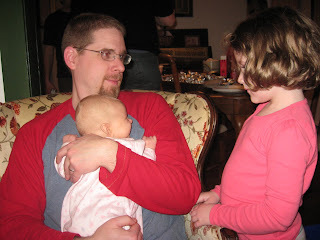 I think this was the fifth time I was even with Jocelyn (the first being a simple hello when Andrew introduced us before they were even dating and the second being at their wedding!). However, I feel like we've known each other for years and see each other often. She's just that kind of friend for me. So, we wanted to soak in all of the time we had with them, which wasn't much and is why Duncan took off from work. Well, we got a "bonus." The Skellys managed to get food poisoning between the WTP and arriving at our house. They didn't know this until the wee hours of Monday morning, however. Andrew and Jocelyn were sick. Really sick. They could barely get out of bed! Do I wish they were well? Of course! But had they been well, we wouldn't have had an extra 24 hours with them! It was a true pleasure to get to know Jason, Beth, and Adam. And it was a joy to serve Andrew and Jocelyn while they were under the weather. Jocelyn, I unfortunately didn't get too many pictures. I was a tad busy:). 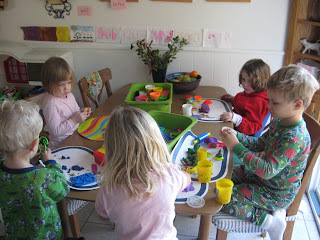 Fun with Play-doh on Monday morning. 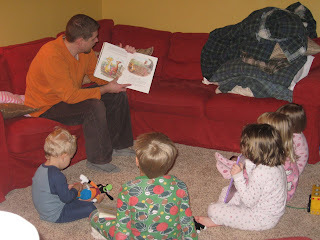 Bedtime stories on Monday night. A daycare center? Come on, how hard could it really be? 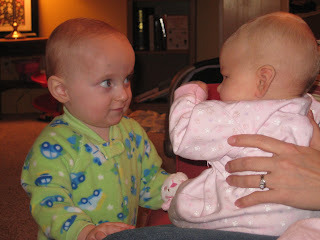 During our WTP weekend, Linus fell in love with Baby Jillian. As the festivities continued back at our house on Sunday evening, Linus' feelings grew deeper. 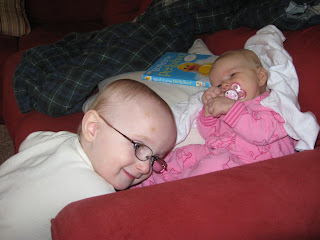 If Baby Jill was in the room, Linus was right by her side. This one was on Tuesday morning right before she left. As you can see, his feelings hadn't diminished in the least. Duncan is still very close with some of his high school friends. Back in 2000, the __TP or the __Tree Party was born. It was decided that being neither on Christmas or New Year's, it could not be a Christmas or New Year's party. Back in 2000, it was the Fir Tree Party. Ever since, there have been__Tree Parties of many varieties. There was the Palm Tree Party, in Southern California, of course. There was the Crab Tree Party, hosted by us in Maryland. There was the Honeymoon Tree Party, immediately following the wedding of one of these friends, in his house even. Fortunately for he and his new bride, they were NOT present. Then there was the Orange Tree Party in the actual OC. Next was Anniversary Tree Party. The sixth __TP, but also the fifth anniversary of the original FTP. Last year was the California Rustic Tree Party, on the west coast again. 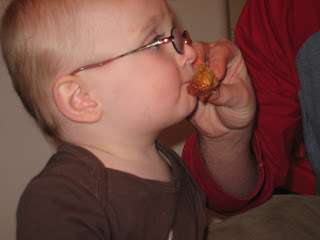 Which brings us to the __TP of 2008: The Wing Tree Party. Wings are a very important element to all of these parties and it was decided that they should finally get the attention they deserve. Linus became buddies with Alan, who traveled the farthest. He and one of his daughters flew in from CA to attend the grand event. 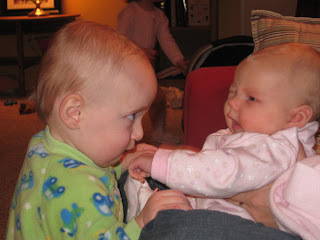 Aubrey and Amelie got reacquainted too. 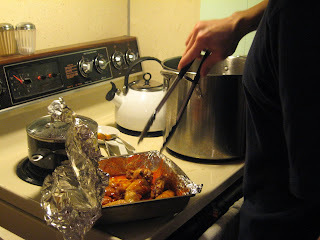 Our host, Culp, prepared the guest of honor: Wings! Linus gave them a try. 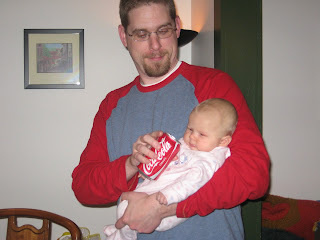 Duncan gives baby Jill her first taste of Coke. 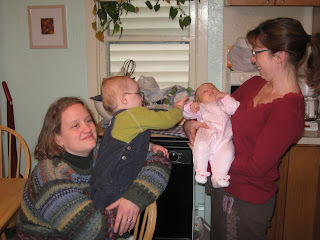 Duncan and Amelie spend some quality time with Baby Jill. 11 adults (2 not pictured) and 11 kids (one in utero) shared 1600 square feet and one bathroom for a little less than 24 hours. Until next year, y'all. Will it be a Peach Tree Party?